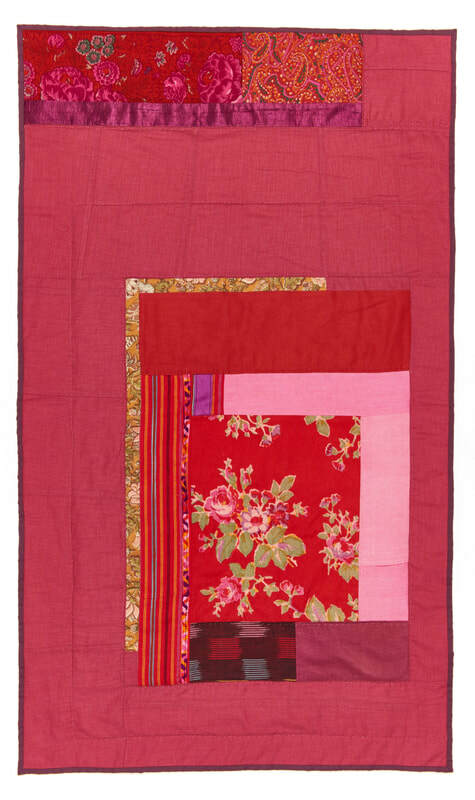 Marie wanted to create a quilt using her late mother’s clothes and accessories. Her mother, Dominique Lenclos, died of ovarian cancer in 2012 and left behind a colourful wardrobe of cotton and linen garments and delicate floral scarves. According to Marie, Dominique was always elegantly dressed and took great care in coordinating the colours of her outfits. One of her greatest sorrows when falling ill with cancer was to see her body transformed, which made finding clothes that fitted her more difficult. Despite all this, she remained beautiful until her premature death at the age of 66. Dominique's clothes were destined for the charity shop, but Marie saved a small collection in a palette of pink, red and purple, including a Kenzo scarf that her mother wore often. That scarf became the central point and we slowly built around it, using various parts of clothing like a pocket, a sleeve, the woven trim of a skirt. Marie worked with me to find the balance of colours and proportions that would be the foundation of the final quilt. For the back I chose to use the remaining clothes and keep their distinctive shape: the A line of a skirt, a piece of sleeve, the visible curved seams defining the waist of a dress. I hand-quilted around the flowers from the scarf, and quilted straight lines over the rest. The lining of one of the skirts became the binding so that all the fabrics used in the quilt came from the clothes Marie's mother wore and loved, giving them a second lease of life. Marie and her brothers presented this quilt to their father as a gift for his 80th birthday. Marie Lenclos is a French-born painter based in South London. When entering Marie's universe, one is immediately drawn by her unique sense for colour, which comes through each of her paintings. Marie's urban landscapes capture the essence of London's architecture with clean lines and perfect shades and shadows, while her abstract, graphic compositions and still life paintings display her flair for colour combinations and her eye for detail.